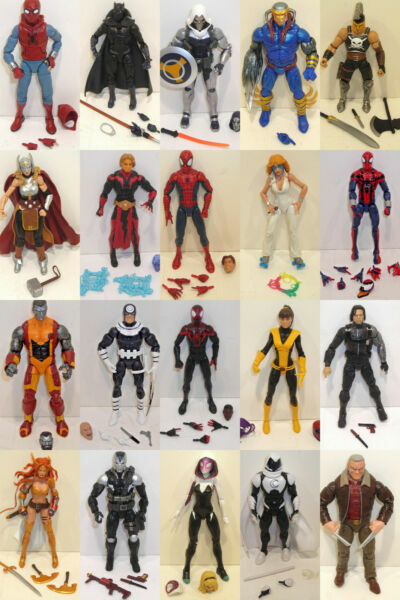 eBay MARVEL LEGENDS ACTION FIGURE(S)* SELECT THE CHARACTER YOU WANT TO PURCHASE USING THE DROP DOWN MENU AND THEN ADD IT TO YOUR CART *Each item will be listed below along with any condition notes. Please read through each description carefully and ask any questions prior to purchasing! You will receive the exact item you select which includes everything in the picture. *STOCK PHOTOS ARE NOT USED*Available for purchase are the following:BAF part(s) are NOT included.Item description:Adam Warlock (Mantis): complete with all accessoriesAres (Hulk): complete with all accessoriesAstral Dr. Strange (Dormammu): complete with all accessories, mark on shoulderAstro Vance (Titus): complete with all accessoriesBeetle (Absorbing Man): complete with all accessoriesBeetle (Vulture): complete with all accessoriesBrother Voodoo (Dormammu): complete with all accessoriesBullseye (Man-Thing): complete with all accessoriesDazzler (Warlock): complete with all accessoriesDrax (Groot): complete with all accessoriesGreen Goblin (Sandman): complete with all accessoriesIron Man (Groot): complete with all accessoriesIron Man Mark 27 (Infinite Series): complete with all accessoriesJackal (Sandman): complete with all accessoriesJessica Jones (Man-Thing): complete with all accessoriesKitty Pryde (Juggernaut): missing onslaught headMockingbird (Red Skull): complete with all accessoriesMoon Knight (Vulture): complete with all accessoriesMs. Marvel (Sandman): complete with all accessoriesNebula (Mantis): complete with all accessoriesNova (Titus): complete with all accessoriesPolaris (Warlock): complete with all accessoriesProwler: complete with all accessories, some factory touch up paint on stomachRocket Raccoon (Mantis): complete with all accessoriesSharon Carter (Red Skull): complete with all accessoriesShatterstar (Warlock): complete with all accessoriesSpider-Man UK (Sandman): complete with all accessoriesStarlord (Mantis): complete with all accessoriesSunfire (Warlock): complete with all accessoriesTombstone (Vulture): complete with all accessoriesWhirlwind (Red Skull): complete with all accessoriesGwenpool (Lizard): complete with all accessories Sub-Mariner (Okoye): complete with all accessories Starlord (Groot): complete with all accessoriesNova (Groot): complete with all accessoriesRocket Raccoon (Groot): complete with all accessoriesGamora (Groot): complete with all accessoriesThe Punisher (Man-Thing): complete with all accessoriesElektra (Man-Thing): complete with all accessories Daredevil (Man-Thing): complete with all accessoriesBlade(Man-Thing): complete with all accessoriesDeadpool (Sasquatch): complete with all accessories Paladin (Sasquatch): complete with all accessories Cosmic Spider-Man (Vulture): complete with all accessories Domino (Sasquatch): complete with all accessories Cable (Sasquatch): complete with all accessoriesX-23 (Sasquatch): complete with all accessoriesDeathlok (Sasquatch): complete with all accessories X-Force Deadpool (Sasquatch): complete with all accessoriesCaptain America (Thanos): complete with all accessoriesIron Spider (Thanos): complete with all accessories Taskmaster (Thanos): complete with all accessories King Cobra (Thanos): complete with all accessories Iron Man (Thanos): complete with all accessoriesThor (Two-Pack): complete with all accessoriesValkyrie (Two Pack): complete with all accessoriesEgo (Two Pack): complete with all accessoriesHouse of M Iron Man: incomplete, legs are loose at the hipTitanium Man Iron Man: incompleteGladiator (Apocalypse): complete with all accessoriesWolverine (Apocalypse): complete with all accessoriesSabretooth (Apocalypse): complete with all accessoriesMagneto (Apocalypse): complete with all accessories Multiple Man (Apocalypse): complete with all accessories Thanos (Walmart Exclusive): complete with all accessoriesPoison (Monster Venom): complete with all accessoriesCarnage (Monster Venom): complete with all accessories Scream (Monster Venom): complete with all accessories Venom (Monster Venom): complete with all accessoriesAnt-Man (Cull Obsidian): complete with all accessories Wasp (Cull Obsidian): complete with all accessoriesBlack Widow (Cull Obsidian): complete with all accessories Black Knight (Cull Obsidian): complete with all accessoriesTyphoid Mary (Monster Venom): complete with all accessories Malekith (Cull Obsidian): complete with all accessories, waist is slightly looseThor (Cull Obsidian): complete with all accessoriesSpider-Ham (Monster Venom): complete with all accessoriesMysterio (Lizard): complete with all accessories, joints are slightly loose below left kneeHawkeye (Allfather): complete with all accessoriesCaptain America (Civil War): complete with all accessories Psylocke b(Apocalypse): complete with all accessories, black hair variant with purple body Crossbones (Civil War): complete with all accessories, leg joints slightly looseTalos (Kree Sentry): complete with all accessoriesNick Fury (Kree Sentry): complete with all accessories Yon-Rogg (Kree Sentry): complete with all accessories Captain Marvel (Kree Sentry): complete with all accessoriesGrey Gargoyle (Kree Sentry): complete with all accessoriesGenis-Vell (Kree Sentry): complete with all accessoriesCombined shipping is offered. Please refer to the shipping chart tab located next to the item description section.